You are here: Home / Fake & Questionable Freebies / Did Someone Tell You That You Won a HUGE Prize? Read This! There’s a relatively new scam going on, and we want you to be aware and stay safe online. After all, we are the home of the Big List of Fake Freebies to Avoid. We’ve spent over 8 years keeping our readers safe from online scams. 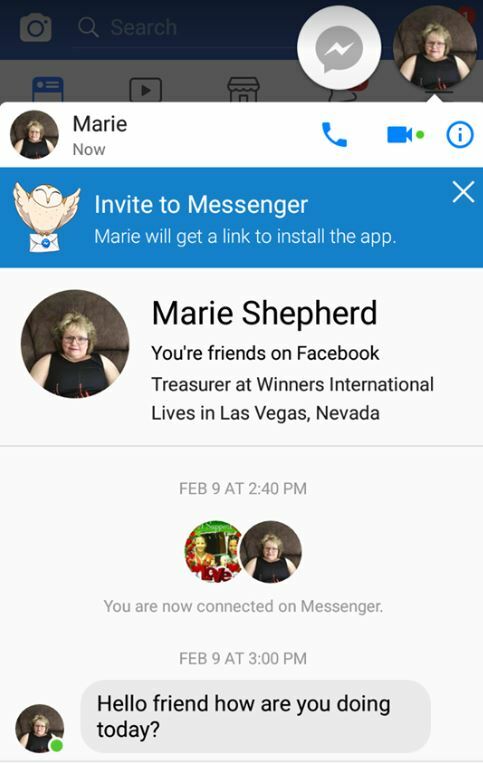 I wish I could say it’s just on Facebook messenger, but we’ve heard of scammers contacting our readers via email, Twitter, Instagram, and even texting on your phone! The good news is, there’s no real danger in simply being contacted. You can simply block them and no harm is done. Do not give them any of your personal information! This might include them asking for your date of birth, full legal name, address, banking information, credit card, social security number, etc. Don’t do it! 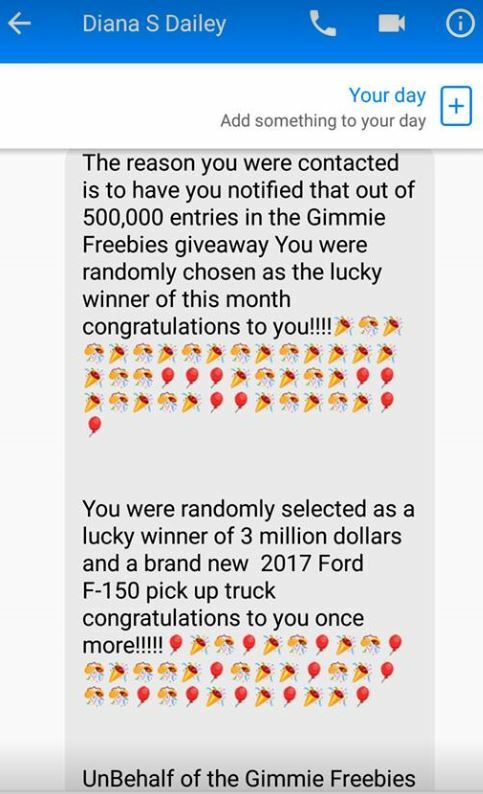 Real companies – such as mine: GimmieFreebies – who have real, legitimate giveaways will NEVER ask for this information from a random text message, from an unverified source. Do not click any links they send you either vie chat or email or anything else! NEVER give out your passwords! And, use difficult passwords. Don’t use the same password for more than one site. NEVER pay for a prize! You do not have to pay for prizes we give away. We will never ask you to pay for a prize! If someone does (and these scammers will! ), they are lying! They will steal your money and you will get nothing. These people are scammers, they are not with this website, page or group. They are not associated with GimmieFreebies. They do not work for us – or the company they claim to be with. They are fakes! 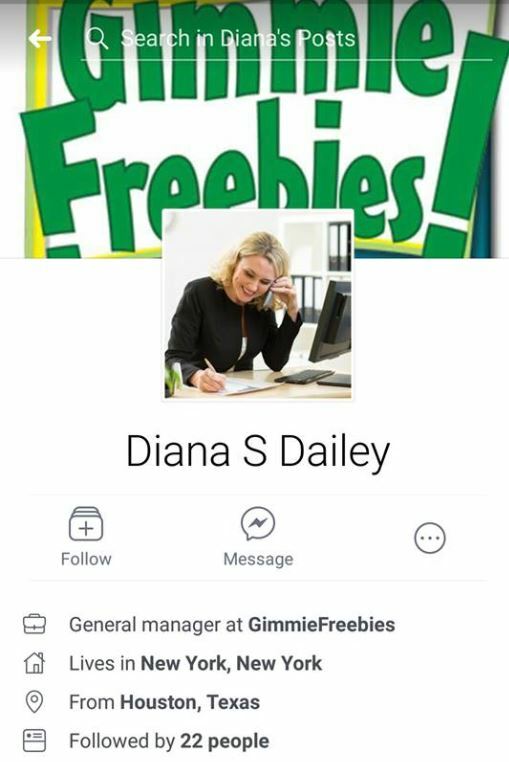 GimmieFreebies does not have a “general manager” – if it did, it would be me (Wendy Larson). Note: I have a fantastic team of ladies who help me find great deals for you, but none of them deal with any prizes we give away. They will not contact you! 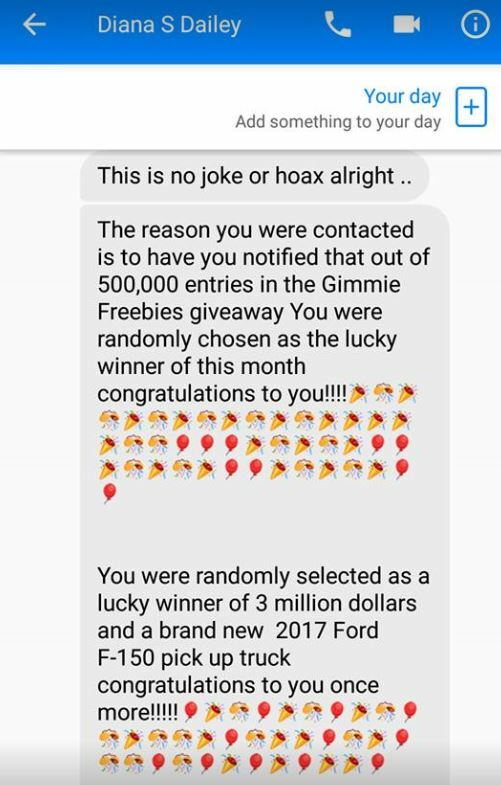 GimmieFreebies will never ask you to pay for a prize! example text from this scammer’s chat: Hello friend how are you doing today? Hello How are you? 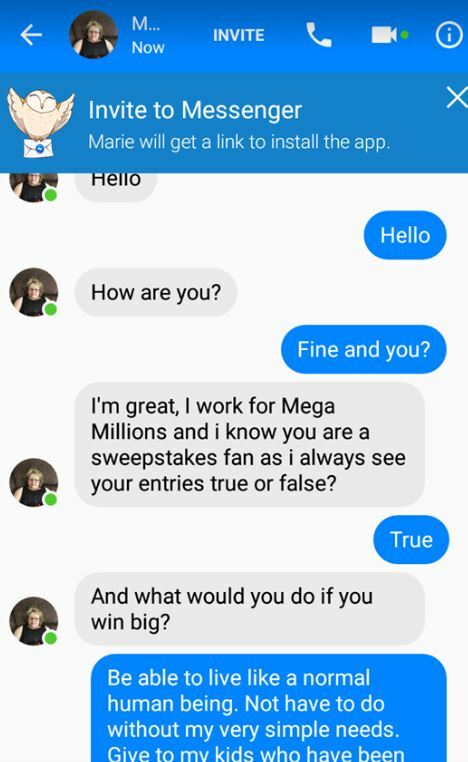 I’m great, I work for Mega Millions (a lottery) and I know you are a sweepstakes fan as i always see your entries true or false? And what would you do if you win big? What if I tell you that you are a winner? 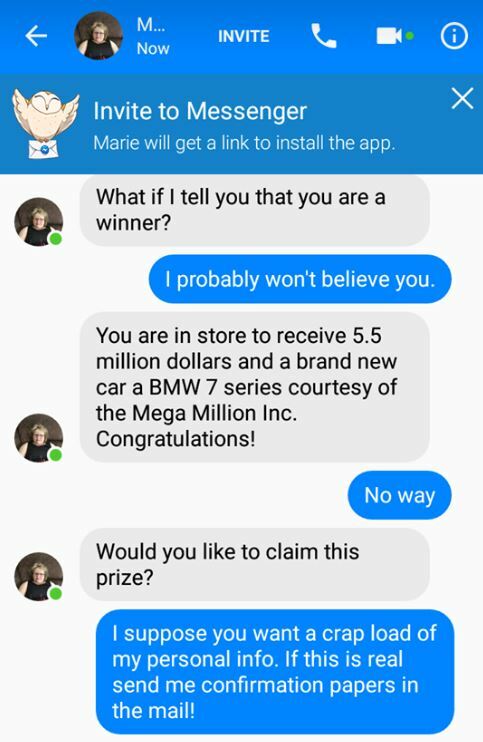 You are in store to receive 5.5 million dollars and a brand new BMW 7 Series courtesy of the Mega Million Inc. Congratulations! Would you like to claim this prize? If you were contacted on Facebook messenger, please follow these steps to report the conversation.